Pass Your CyberSec First Responder Exam - 100% Money Back Guarantee! "CyberSec First Responder Exam", also known as CFR-210 exam, is a Logical Operations certification exam. Pass your tests with the always up-to-date CFR-210 Exam Engine. Your CFR-210 training materials keep you at the head of the pack! Now you can practice your study skills and test your knowledge anytime and anywhere you happen to be with PDF Version of your CFR-210 exam. Printable CFR-210 Questions & Answers PDF Version gives you comfort to read at leasure without using your computer or gadget. * PDF Version cannot be purchased without the main product (CFR-210 Questions & Answers) and is an add on. Test-King has a remarkable Logical Operations Candidate Success record. We're confident of our products and provide a no hassle money back guarantee. That's how confident we are! 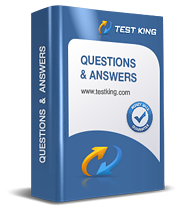 Experience Test-King Logical Operations CFR-210 exam Q&A testing engine for yourself.